Emergency preparedness planning is a scenario-based tool to prepare for potential emergencies. The objective of EPP is to create systems and structures that support CARE offices to achieve quality preparedness and response. This process should increase the capacity of offices to alleviate potential disaster impacts and improve the level of readiness to respond to emergencies. 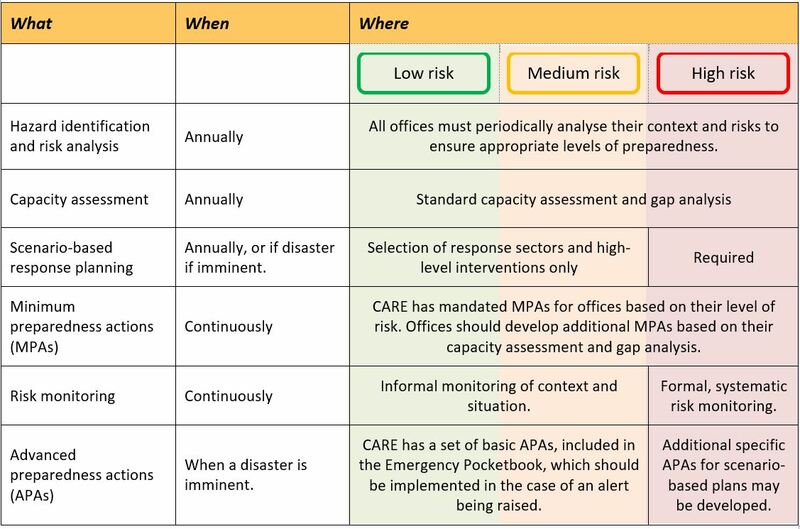 CARE’s approach to disaster and climate risk reduction encompasses the full range of prevention, mitigation, preparedness and response measures to ensure both immediate needs in an emergency are met and underlying causes are addressed. Disaster and climate risk reduction must focus on taking pre-emptive measures to help communities avoid emergencies and become better equipped to reduce the impact of disasters. 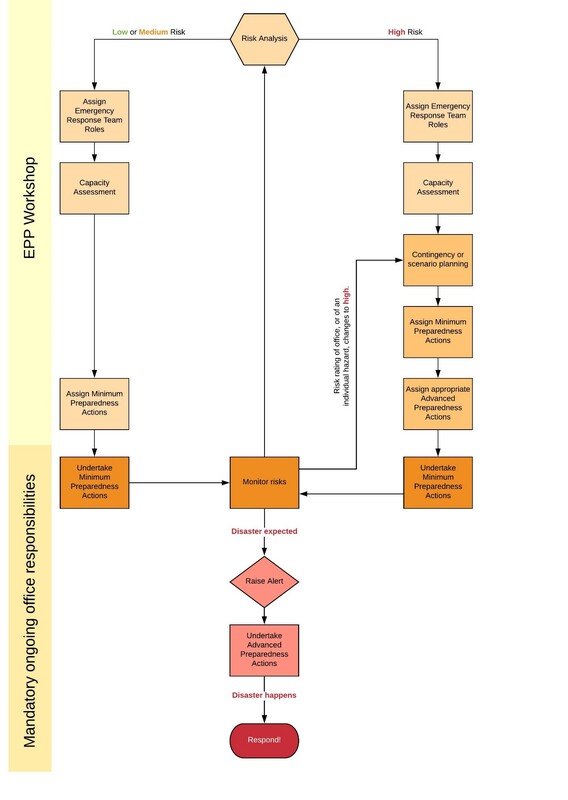 Identify high-risk situations and design programmatic interventions based on likely scenarios. Have an Emergency Response Team (ERT) in place and members familiar with the CARE Emergency Toolkit and Emergency Protocols. Identify at least three high-risk level disaster scenarios and develop mitigation, preparedness and response strategies. Have identified capacity gaps and established a Capacity Building Action Plan that includes staff and systems development needs. Identify the funding requirements to implement the Capacity Building Action Plan. Be able to realistically recognise its capacity and limitations. Be able to strengthen community capacities to reduce the effects of identified risk situations and be better prepared to respond. Confident enough to ‘raise the alarm’ in the event of an emergency and to provide best estimates of the situation. Be able to carry out rapid emergency needs assessment during the onset of emergency and provide timely information to CARE International for decision-making. For detailed information on security management frameworks, refer to Chapter 14- Safety and security. Emergency preparedness plans and safety/security plans follow the same framework: both planning tools are based on identifying potential risks, and developing risk reduction strategies, standard operating procedures and contingency plans. While the EPP considers disaster risks (floods, earthquakes, droughts, conflicts, etc.) that typically affect CARE beneficiaries, the SMF mainly considers risks to CARE staff and assets. Consequently, risk reduction strategies, standard operating procedures (protocols), and contingency plans for EPP and SMF vary. While SMF is a planning tool of the safety and security function, EPP is a broader and more comprehensive planning tool that includes strong capacity building components. Both should consider options to reduce disaster risk in non-emergency programmes.